SANAA, April 6 (YPA) – The Supreme Economic Committee in Sanaa on Saturday welcomed any steps, initiatives or real economic measures that would alleviate the suffering of the Yemeni people. The committee called for the economy neutralization, demanding the rabid release of oil derivatives vessels being held by Saudi-led coalition countries. 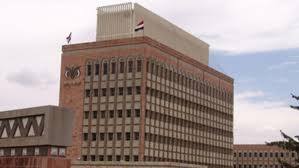 This came in a statement issued by the committee, in which it replied to the allegations of Hafedh Mayad, Aden central bank’s governor appointed by the exiled Hadi, during his meeting with the 19 countries’ ambassadors on April 3, 2019. The committee refuted Mayad’s allegations about that he sought to prevent speculation in the dollar, achieve the exchange rate stability and return the monetary cycle of banks, stressing that what he said was just political misleading. In its statement, the committee also called on the United Nations and the international community to take their humanitarian and moral responsibilities towards the coalition’s abuses and the disastrous effects due to the absence of oil derivatives. #BREAKING: #SAADA – Coalition launches an air strike and a ground attack on Baqim district.